If you’re like the many advertisers flocking to Amazon, especially for the upcoming holiday season, you are likely still learning the secrets of marketing on the platform. How do you stand out when so many other businesses around the world are competing for the same benefits of the e-commerce site? As dismaying as it may seem, it is not impossible to succeed on Amazon. It is quickly becoming one of the biggest advertising platforms, moving up to third place behind Facebook and Google. 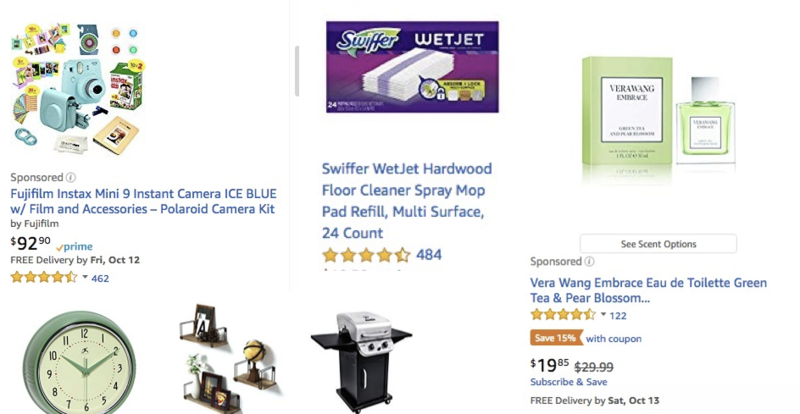 There’s still a lot of mystery about mastering Amazon advertising, so it helps to look at what’s working for other brands that use the platform. There are many elements that make a good Amazon ad. In addition to choosing the right type of ad format that fits your goals, you need to incorporate relevant and high-quality images, detailed descriptions, and unique keywords. By identifying the elements of 13 Amazon ads that do it right, you can go forth and produce your own rockin’ Amazon ads. It identifies the brand Fujifilm in the description while identifying the product as a Polaroid camera. It includes the product type in the title (Instax Mini 9 Instant Camera). 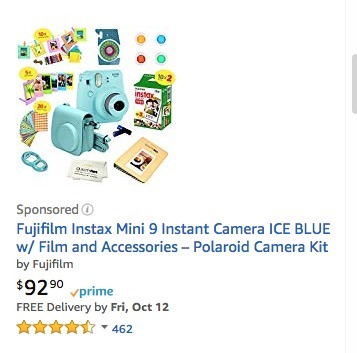 The description tells you what the purchase includes (camera, film, and accessories). Each word in the description serves as a unique keyword. The photo matches the description and shows all the included accessories. The product has a good Amazon rating (4.5 stars from 462 reviews) that serves as social proof. It identifies the brand (KLIQ) and describes the item accurately: an instrument tuner. It tells you what it does. 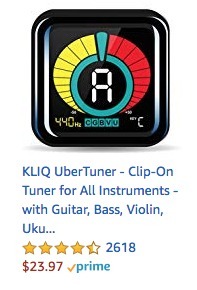 (It’s a clip-on tuner for various instruments). It includes other instruments it can be used for (guitar, bass, violin, and ukulele.). The photo is a close-up of the product. The product has an excellent Amazon rating (4.5 from a whopping 2,619) that serves as social proof. The logo appears three times, drilling the brand into your mind. The description and photo accurately describe the item (toilet paper). It features two products (ultra strong and ultra soft) so you have a selection to choose from. The brand name (Samsung) is in each product description. The item is accurately described as a robotic vacuum. It features three powerbot products so you have a selection to choose from. The descriptions give sufficient details about each product (“Turbo,” “Pet Robot Vacuum”). The Swiffer brand appears in the image and the description. The description accurately describes the item as WetJet pad refills. 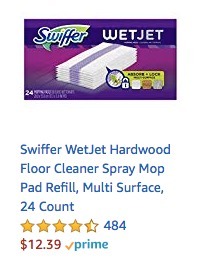 The description tells you what the product does (the pads are used with the Swiffer mop to clean hardwood floors and multi surfaces). It includes specifics about the product (24 pieces, compatible with the Swiffer WetJet spray mop). The photo matches the description and gives you a close-up of the product. The product has a good Amazon rating. 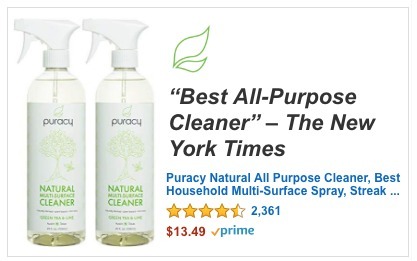 It clearly identifies the brand Puracy in the ad image and accurately describes the item as an all-purpose cleaner. It tells you the product’s purpose: it cleans all types of household surfaces. It includes specifics about the product (natural, spray, all purpose). It features, in an attractive bold font, a review from The New York Times, functioning as powerful social proof. The logo is clearly and visibly featured next to The New York Times review. 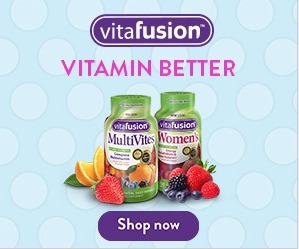 It clearly identifies the brand by including the Vitafusion logo in the image. It accurately describes the item as vitamins. It features bright colors that pop and that match the brand logo. It includes images of fruit to associate the products with health and all-natural, delicious ingredients. It has a clear call-to-action (“shop now”) that takes you to the brand’s Amazon storefront. The title description is the same as the book title, making it easy to identify. The image is the book cover, matching the title description. 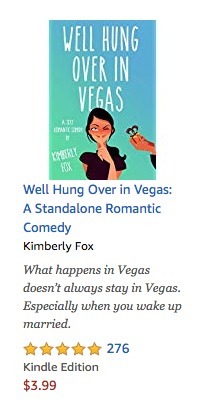 It includes a brief summary of the book in two, very succinct sentences (“What happens in Vegas doesn’t always stay in Vegas…”). The image clearly features the brand (SUNPOW) in an isolated area that allows it to stand out from the product. 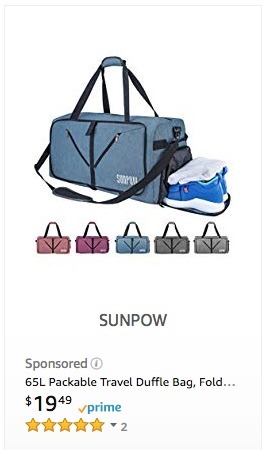 The product image and description shows what the item is (travel duffle bag). It includes specifics about the product (65L, packable, travel, fold). It includes multiple photos below the main photo to show you the different colors the product comes in. It clearly features the Microsoft brand logo and what the item is (Surface Pro laptop). It features three of the Surface Pro 6 products to give you a selection to choose from. The photos for each featured product match the descriptions. Each word in the descriptions serves as a unique keyword. The descriptions give sufficient details about each product (“LGP-00001,” “Intel Core i5,” “8GB”). It clearly features the Listerine brand logo and what the items are (mouth cleaning products). It features three of its mouthwash products so you have a selection to choose from. The descriptions give sufficient details about each product (“Antiseptic Mouthwash,” “Fresh Breath,” “Fluoride-Free”). Each featured product has a good Amazon rating. 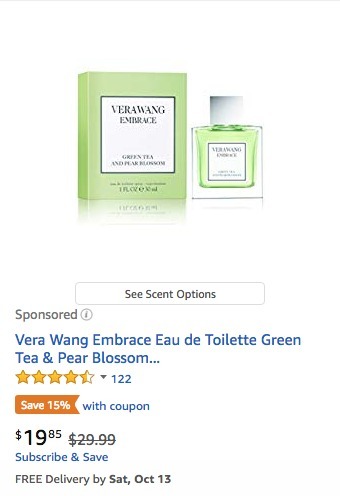 It clearly features the Vera Wang brand logo and shows you what the product is (perfume). It includes specifics about the product: embrace contains green tea and pear blossom. 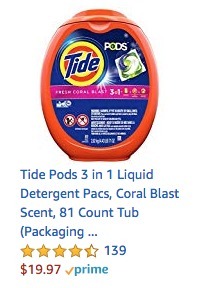 It clearly features the Tide logo and describes what the item is (detergent pods). It tells you the number of pods the package contains (81 count). It includes specifics about the product (coral blast scent, 3 in 1 liquid detergent pacs). The photo matches the description and gives a close-up of the product. There’s a lot of information to digest, but hopefully you’ve noticed these ads’ pattern of qualities that make them work. Keep a list of the qalities handy when putting together your own Amazon ads. It will help guide you through the creation process. You are already well on your way to a successful holiday season on Amazon!